"Festivals are not merely the commemoration of historical events or personalities. They are in and of themselves, each year, spiritual events carrying significance that grows and deepens with the developing phases of human evolution." 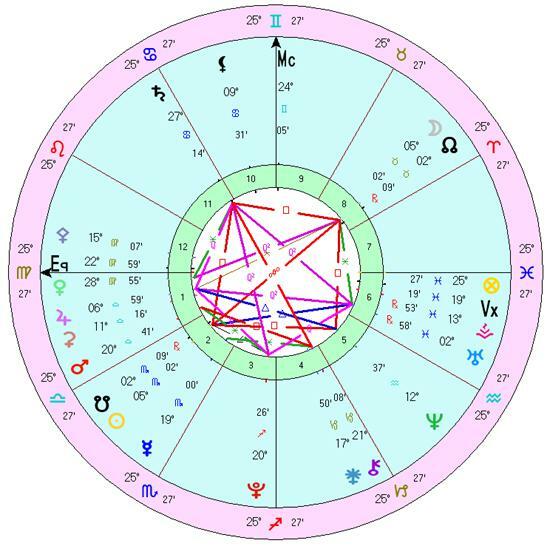 Perhaps you might remember that the chart of November 8, 2003 contained a Total Lunar Eclipse that coincided with the appearance of a Grand Sextile pattern, comprised of the Sun, Moon, Mars, Jupiter, Saturn and Chiron. That chart was the basis for what came to be known as The Harmonic Concordance. My understanding of that planetary picture projected an “astro-Spiritual best case scenario” for the outworking of the dynamic energies that the chart's metaphors described. It found expression in a gathering of many millions of people worldwide—calling, in one voice, at one moment of time, for Unity, Healing and the descent of individual God Conscious awareness. In this piece, I would like to bring yet another astrological configuration to your attention. I feel it offers a similar opportunity for such a gathering, and for such a purpose. I present this information for your consideration, comments and contributions to the dialogue on these charts. It seems that Jill Whitman of Toronto, who describes herself as “…more of a novelist than an astrologer,” was doing some research on possible future Quintile patterns when she came across the chart of October 1, 2004. (The Quintile series of aspects is not readily apparent, even to the trained astrologer's eye. They arise from the division of the 360° circle by five. The two divisions that are up for discussion here yield aspects of 72° and 144°.) I encourage anyone interested in this subject to read astrologer Ed Gillam's posting of his correspondence with Jill concerning it and her subsequent astrological finds. (http://www.asteria.freeserve.co.uk/grandquint/). Jill also has recently put up her own site, which may be found at http://www.grandquintiles.co.uk/. There she details her discovery and subsequent research. Of course, using the larger orbs, which a number of astrologers would, the pattern will be in place for both Grand Quintiles over a wider range of degrees and for a longer duration of time. This does not diminish the fact of their appearance. Further still, the correspondence between Jill and Ed also brought to our attention the fact that on the morning of the 28th at 4:07 am, BST, another Total Lunar Eclipse will occur, also in Taurus/Scorpio as was the case with the Concordance Eclipse, only some 17 hours before the onset of the second Grand Quintile. In my own research of this astronomical oddity (which uses a more conventional allowable orb for the quintile series than does Jill's), I have found that the pattern, as it appears in the charts above, is exceedingly rare. Rarer still is the appearance of a Total Lunar Eclipse on the same day as one of these configurations. A scan of the dates provided by Jill suggests that there might not be another like it in the 2,500 years that her research has thus far covered. Add to that the tidbit that there is a Partial Solar Eclipse (the line of which crosses over North Korea, BTW) on October 14th, the midpoint date between the two GQs, and we have quite a spectacular set of astrological events in store for us this October. Indeed, in terms of actually "seeing" some form of physical manifestation during this 28 day span, it is quite possibly an even more potent time than was the Concordance. A dear friend, when I told her about this new pattern, chuckled and said, “You mean that this configuration doesn't have that little piece of space junk, Chiron, in it?” Well, no, it doesn't. The use of Chiron in the Concordance chart was one of the two major objections that I heard from some in the astrological community about it. Obviously, not every, perhaps not even most, astrologers use Chiron as a planet. I used it because I have seen it at work, with power and impact, in hundreds of client charts. But it is not present in these charts. Robert Hand and Bil Tierney, both referencing John Addey's work on harmonics, have noted a certain destructive quality to the Quintile series (72°, 144°), based on charts of such notable bad guys as Robespierre and Hitler. They do, however, also note that there is a positive and creative quality inherent in it. Hand, for instance, says that he associates the five-series with transformation and "...the fundamental energies of change [and]...ability to turn creative inspiration into concrete end-products." 1 Tierney tells us that in the early esoteric schools of astrology "...the quintile was considered to symbolize an aspirant's creative soul alignment with the Will of the Cosmos, suggesting that quintiles have occult, transcendental undertones." 2 He further suggests that quintiles fulfill their lofty universal potential once we have struggled to become more self-realized. Both authors speak of a drive and determination to create associated with the Quintiles. Yet another perspective, offered by A.G.S. Norris tell us that "...the quintile aspect is of ...importance in delineation from a spiritual point of view ...".3 Summing up and in short, the Quintiles instill the spiritual drive to create a transformative and positive transcendental experience emerging from the energies of the interacting planetary pair. Moon to Saturn = the spiritual drive to create and transform feelings of isolation and loneliness into a transcendental experience of wholeness and unity. Moon to Sun = the spiritual drive to create and transform the inner psychological between the male and female within the psyche. Moon to Pluto = the spiritual drive to create a powerful drive for emotional transformation through subconscious desires. Moon to Uranus = the spiritual drive, dictated by the feelings, to transform the emotional need for freedom and unusual experiences. Saturn to Sun = the spiritual drive to transform limitations on free will, principles of right and wrong and the one's experience of structure and personal limitation. Saturn to Pluto = the spiritual drive to transform circumstances that are rigid, restrictive and extremely difficult. Saturn to Uranus = the spiritual drive to transform the tension between restrictions and the desire for freedom from physical bounds. Sun to Pluto = the spiritual drive to create a transformative experience in regards to issues of power and effective forms of regeneration. Sun to Uranus = the spiritual drive to transform the desire for unique self-expression, limitations and restrictions of the past in sudden, original and unconventional way. Pluto to Uranus = the spiritual drive to create a sudden, complete and total transformation of situations of long standing cause. Venus to Chiron = The spiritual drive to create a transformative healing through the power of Love. Moon to Jupiter = the spiritual drive to create and transform the positive flow of nurturance and generosity through the emotional connection to the Spiritual plane. Jupiter to Saturn = the spiritual drive to transform with the purpose to establish a state of balance between the physical status quo and the desire to expand into something larger. Of course, there are a raft of other interesting planetary "inputs" at that moment which modify the statement of the pattern. The comments that I have put forward here obviously and admittedly present my spiritual "best case scenario" of the these two charts. Again, we invite commentary on any and all of those other points of input, from those of every astrological persuasion. I would like to point to the following in connection with the Harmonic Concordance chart. 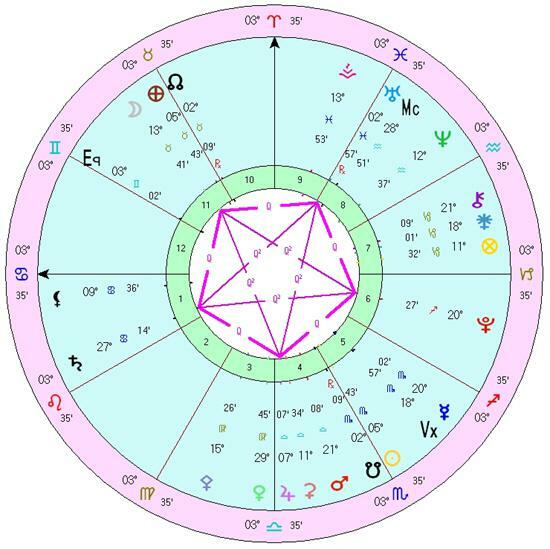 The major contact point between the Concordance chart and both of the GQs is the Moon ( HC M = 16° Taurus, GQ Ms = 12° to 16° Taurus for their duration). Those should be transiting conjunctions in anybody's book. Now, the Moon is the primary Feminine element in astrology. The primary function of the Feminine energy is the manifestation of form. 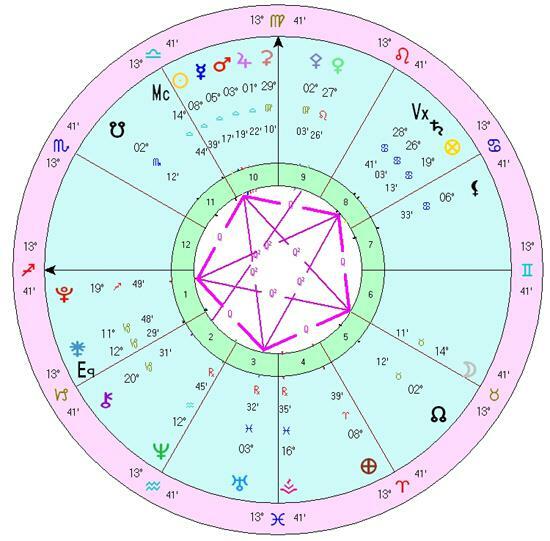 Astrologically, since one of the major qualities of the Concordance chart was the union of the Masculine and Feminine energies, this transit suggests to me a "spiritual best case" wherein what was conceived in that Concordance "Union" will be given birth through the Feminine energies in the GQ charts. As mentioned before, as if the GQ configurations are not enough of an astrological signal that big things are a-brewin', the Taurus/Scorpio Total Lunar Eclipse on the morning of the 28th and the Partial Solar Eclipse on October 14th, (on the midpoint date between the two GQs) should light up astrologers' radar screens the world over. Because of the coincidence of the Taurus/Scorpio Total Lunar eclipses in both the Concordance chart, and in this chart of October 28th, and because they are quite nearly one year apart, I have taken the liberty of calling the sequence “The Harmonic Concordance II.” Once again, we are encouraging the global tribe of Modern Mystics to re-unite in yet another prayer of conscious intent and Gratitude. The conscious intent that we held at the Concordance was a threefold call for Unity Consciousness, Healing for ourselves and, most importantly, for Mother Earth, and for the descent of individual God Conscious awareness. For the Concordance II celebration and prayer, may I suggest that, along with re-invoking those intents, we specifically add a fourth, for the reawakening of the Divine Feminine—in our own and all of Humanity's consciousness. Recalling the recent Venus Crossing of this past June 8th, which carried with it much Feminine energy, Phil Gruber pointed out to me that the five-pointed star pentacle has long been considered to be a Feminine symbol, and dates back to the Babylonians who associated it with the Goddess Ishtar. Considering that, and our heightened awareness of this Feminine energy due to the Crossing, it seems to be a perfectly appropriate addition for Concordance II ceremonies. Of course, considering this very active month of October, any of the above-mentioned days would be well suited to another gathering of the worldwide spiritual community. But, once again, we are presented with a single ideal moment that is most appropriate for a global prayer of conscious intent: the perfection of the Total Lunar Eclipse, at 4:07 am (GMT), on October 28th. Please join with us in broadcasting these prayers of intent to the Universe, in gatherings with others or in your private Celebration and Prayer. * Since the Moon is the key element in the formation and dissolution of the GQs, I have arrived at these times by calculating the midpoint in its passage into and out of the patterns. In these calculations, I have used orbs of 2°10'/1°00' Applying/Separating for the planets, and 2°30'/1°30' Applying/Separating for the Moon, as the Lights (Sun and Moon) have a wider orb of influence than do the planets. Mars: This does not seem to me like an overly large orb, especially considering that it is applied to the two Lights. Who among us would not accept that as an orb when looking at an aspect involving the Sun or the Moon in a chart? ** While I generally do not use more than a 2° orb for the Quintile series, and then only for the inner planets, in this case I have done so because the dynamic of the pattern seems to me to demand it. It should be noted that, according to Ed Gillam, there are proponents of Addey's Harmonics theory who would give much wider orbs to the Quintiles, some even rating it as more powerful than the Square. 1 Robert Hand, Horoscope Symbols (Gloucester, MA, Para Research, 1981), p.132. 2 Bil Tierney, Dynamics of Aspect Analysis (Sebastopol, CA, CRCS Publications, 1983), pp. 46-47. 3 A.G.S. Norris, Transcendental Astrology (New York, Samuel Weiser, Inc., 1970), pp. 205-13. 4 Hand, op. cit., pp 169-77. Charts were generated in Solar Fire.